Never in a million years would I have imagined that my longstanding Sports Illustrated subscription would yield something relevant to NOPE. 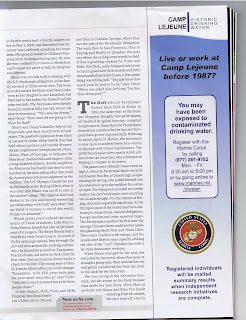 This piqued my interest, so I googled "Camp Lejeune" and "water" and came up with a treasurer trove of stories that show that as many as 1 million ex-Marines and their families drank toxic wellwater at Lejeune and may be stricken with all sorts of illnesses (or birth defects) as a result of ingesting TCE and PCE, two severely toxic chemicals. (Not surprisingly, Navy leadership is taking the high road by battling the federal agency overseeing toxic substances over funding a mortality study at Lejeune, according to AP). Take what you will from this anecdote, but for those - including a particular local veterans group - that wonder why we have an ax to grind with the Department of Navy over proposed civilian housing at NWS Earle, and why we do not buy the Navy's argument against making the issue go away, keep in mind the 29 EPA Superfund sites at Earle and their proximity to Laurelwood housing. Two decades after it happened we now have the DoN/Marines hinting that, yeah, maybe there was something wrong with the water that servicemembers and their families were drinking at Lejeune. Granted, any prospective Laurelwood tenants will be drinking public water(not wellwater), but, still, the argument here is that, environmentally, who really knows what's going on at a military base where the job is inherently dangerous? Will it take 10-20-30 years to find out that military dependents at Laurelwood in the 1990s and 2000s (and subsequently civilian tenants from 2010-2040) are in bad health or birthing kids with defects as a result of airborne or some kind of other exposure to toxic chemicals at the base? (NOPE is in the process of working on the environmental case at Earle). I, for one, would not want to throw ANYONE, let alone a U.S. veteran who "needs a place to live" (as Neptune Housing Authority espouses), to a dangerous housing situation, merely because the Navy has some vacant, underutilized housing within its Earle base...and because it says "yeah, we can handle the security obligation." Such a notion is utterly shortsighted and blind to the environmental hazards of the military weapons business.